With bye weeks finally in the past, the DraftKings' main slate features a full player pool. This raises the importance of roster construction and makes player selection even more important. With that said, here are this week's standout plays on the DraftKings' main slate. At 5.5k, Kirk Cousins comes in shockingly affordable for a quarterback on a team with the third-most pass attempts in the NFL. Cousins has bested 18 DraftKings' points in three of his last four games and faces a Patriots' defense that ranks 30th in Football Outsiders' Adjusted Sack Rate. Projected to throw from a squeaky clean pocket as 5.5-point underdogs, Cousins looks like a strong cash option. With Kareem Hunt being released, Spencer Ware comes in at a bargain bin price for a bellcow running back. Ware also has the best matchup on the slate against the Oakland Raiders, who have allowed the most rushing yards this season (1,481). 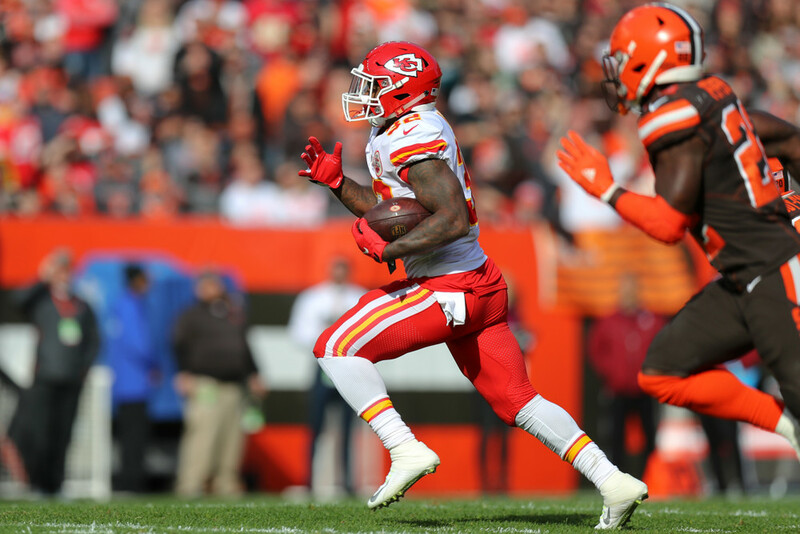 Hunt had at least 17 touches in each of his last five games and Ware should see close to that much this week with the Chiefs favored by 15.5-points. Ware should lock down cash lineups this week. Coming in at 6.7k, Aaron Jones has seen at least 16 touches in all of the Packers' last four games, including a season-high (20) last week. Jones also draws a plus matchup against the Arizona Cardinals, who have allowed the second-most rushing yards to backs (1,454). As 14-point favorites, Jones should be fed early and often. He makes sense in cash and GPPs this week. Somehow the league's fourth-most targeted receiver enters this week as DraftKings' eighth-highest priced receiver. With 114 targets on the year Stefon Diggs and the Vikings' are pegged as 5.5-point underdogs, the Vikings project to throw throughout this contest. Diggs makes a nice stacking option with Cousins in this spot and a solid solo GPP play. Despite costing an extra $100, Brandin Cooks looks like a superior play to Robert Woods in Week 13. Cooks has out-targeted Woods 24 to 16 in their last two games. The Lions have allowed the sixth-most yards to receivers over the past four weeks (780), boding well for all Los Angeles pass catchers. Cooks has also run 75.6% of his routes from the slot over the last two weeks, helping him avoid the stout coverage of Darius Slay. Both Woods and Cooks should be mixed into GPPs, but Cooks looks like the superior play. With DeSean Jackson sporting a cast and not catching passes on Thursday, Chris Godwin looks like a supreme value on this slate. With Jackson limited last week, Godwin went on to play 67% of the Buccaneers' snaps. Tampa Bay has attempted the second-most passes this season and if Jackson sits, Godwin becomes an immediate cash lock. Playing fantasy's least consistent position, Matt LaCosse looks like a diamond in the rough following Jeff Heuerman's season-ending injury. Case Keenum has targeted the tight end on 22% of his throw, and LaCosse stepped in to play a season-high 47% of the Broncos' snaps with Heuerman out. The Bengals have allowed at least 24 points in each of their last six games, and the fifth-most yards to tight ends (752). LaCosse needs to be considered in cash as the strongest salary-saving option on the slate.